Hindus in India have been marking their main festival of the year, Diwali, amid fear and tight security in Delhi, three days after bombs killed 62 people. Some worshippers faced checks before entering temples in the capital as a huge manhunt for the bombers continued. 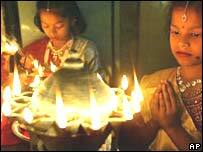 The BBC's Mike Wooldridge says the bombs have overshadowed celebrations for the festival of lights. On Monday, Prime Minister Manmohan Singh hinted at a Pakistani link to the bombs, which Islamabad rejected. Observers say India has been careful not to blame publicly any particular group, as the two countries make tentative progress in their peace process. 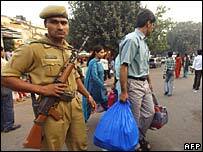 On Tuesday, leading Pakistan-based Islamic militant group Lashkar-e-Toiba denied it had anything to do with the blasts. Its name has featured widely in speculation about who might be responsible for the bombings, and it has frequently been accused by India of attacks in the past. A little-known Kashmiri group said on Sunday that it had been behind the attacks the day before. Police say they are trying to verify the claim by Islami Inqilabi Mahaz. India's authorities say they believe Saturday's bombs in busy markets were intended to target shoppers ahead of Diwali and the Muslim festival of Eid. Trading was generally reported to have been hit as people in Delhi heeded official calls to stay away from public places following the attacks. "The bombs have made a huge difference. My sales are down by more than 50-60%," shopkeeper Dinesh Gupta told the Associated Press. "People are feeling very low. They don't want to celebrate Diwali they way they normally do." Our correspondent says traditional firecrackers were being burst in Delhi, but amid a more restrained atmosphere. Diwali represents the triumph of good over evil - and our correspondent says many Hindus will see it as having more than the usual significance this year. Meanwhile, the United Nations has condemned the triple bomb blasts as reprehensible and called for those behind them to be brought to justice. More than 200 people were injured in the attacks, of whom about 90 remain in hospital, some in a critical condition. Worried relatives are still looking for loved ones among charred bodies that have yet to be identified. On Monday, India gave its clearest indication yet as to who it thought was behind the bombings, when the prime minister hinted that Pakistan-based militants were involved. Mr Singh told Pakistani President Pervez Musharraf he was "disturbed and dismayed at indications of the external linkages of terrorist groups with the 29 October bombing". He added that he expected Pakistan to honour its promise to end cross-border terrorism. Islamabad, which was swift to condemn the bombings and offer support, says it has no indication that Pakistani groups were involved. "Unless they share the evidence with us, it remains a mere claim which we cannot accept," a Pakistani foreign ministry spokeswoman said. Who is behind the bombings? 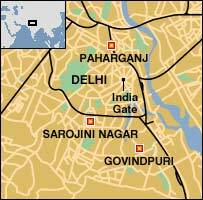 Delhi tries to come to terms with deadly bomb attacks, reports Sanjoy Majumder. Did you witness the explosions?